CE does not have any software for Blackberry based phones. We have the following alternative suggestions at this time. Unfortunately, we are not aware of any applications for monitoring internet browsing usage on Blackberry phones. 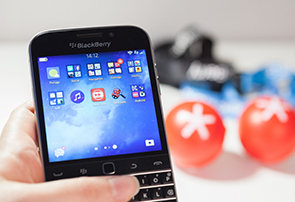 There are several software companies that claim to monitor Blackberrries. To the best of our knowledge, they can only monitor phone calls and text. None of them can actually monitor internet activity. When you set a PIN for Parental Controls, the only way to reset the PIN if you forget it is to delete all the data on the smartphone. Click Security > Parental Controls. Select the Enable checkbox to turn on Parental Controls. Select one or more of the following options to restrict the browser and other apps. Press the Menu key > Options. Press the Menu key > Save. Enter a four-digit PIN. Click OK. Confirm the PIN. Click OK.
On newer models (7.1+) there are parental controls that can restrict many features of the Blackberry, including internet, Facebook etc. JnetMobile, from the creators of Jnet, offers filtering for Blackberry. The service requires the use of Blackberry Enterprise Server. Smylesafe is a kid-safe browser and parental control app. Allow good content in while keeping bad content out. Block inappropriate websites by age-group or category. Set Internet time limits and block apps. SmyleSafe has location tracking with geofencing built-in. If your child travels outside a limit you set, you will be alerted by email. You can also adjust settings or monitor locations and website visits from your online account. Guard Your Eyes offer a special service to help people delete the browser on their Blackberry. That's right, it is possible to have all the conveniences of the Blackberry and still not have any internet access. E-mails and all other applications will continue to function normally. (The browser can be put back one day if necessary, upon request).